The Singapore economy is expected to expand by 1.9% y-o-y in 1Q19, according to the March survey of professional forecasters by the Monetary Authority of Singapore (MAS). SINGAPORE regulators and their US counterparts have agreed to mutually recognise certain derivatives trading venues in either market, hewing to reforms undertaken by the Group of 20 (G-20) bloc. Singapore continues to offer the best quality of life in Asia, an annual survey by consulting firm Mercer has found, but worldwide, it is still ranked at 25th. It also ranks highest for personal safety. Singapore has been clear and consistent in its position that Malaysia has lost the right to review the price of water under the 1962 Water Agreement, said Singapore’s Ministry of Foreign Affairs (MFA) on Wednesday (Mar 13). Singapore’s aviation regulator banned the use of Boeing 737 MAX aircraft in the country’s airspace following a deadly Ethiopia plane crash at the weekend. A S$20-million research centre which aims to develop greener ways of recycling electrical and electronic waste (e-waste) was launched on Wednesday (Mar 13) by the Nanyang Technological University (NTU) and French Alternative Energies and Atomic Energy Commission (CEA). The Singapore Academy of Law (SAL) will establish a co-working space called CLICKS @ State Courts in Singapore’s lower-tier courts early next year. Technology like artificial intelligence (AI) should not be used for the sake of it, but rather in tandem with creative and innovative thinking when solving problems. The Singapore High Court has struck out veteran blogger Leong Sze Hian’s counterclaim against Prime Minister Lee Hsien Loong’s defamation suit, citing Mr Leong’s failure to disclose a “reasonable cause of action” in his counterclaim. A traditional Chinese Medicine (TCM) practitioner was suspended for three years and fined S$5,000 after he administered various treatment that led to a patient having to amputate his leg from the knee down. The Immigration and Checkpoints (ICA) authority said on Wednesday (Mar 13) it has seized 6,000 cartons of duty-unpaid cigarettes that had been hidden in game machines in a warehouse along Tuas Avenue 3. In regards to the defamation suit made against veteran blogger and human rights defender Leong Sze Hian by Prime Minister Lee Hsien Loong, Front Line Defenders (FLD) took a stand and said that it strongly condemns the action. If you think combining arts and maths doesn’t quite add up, Singapore’s first mathematics-themed arts festival aims to prove it can be a winning equation. South-east Asian markets continue to remain important to United States businesses, as a poll of 210 business executives in the region showed an increasing percentage expecting profits to increase, compared with two years ago. Are we overusing acronyms in Singapore? As a journalist covering Parliament in the past fortnight, I found myself entangled in an alphabet soup of acronyms that would befuddle even the savviest observer. The laundry shop manager accused of murdering his lover and burning her body told a psychiatrist after his arrest that he did not have an extramarital affair with her. Technology like artificial intelligence (AI) should not be used for the sake of it but rather in tandem with creative and innovative thinking when solving problems. 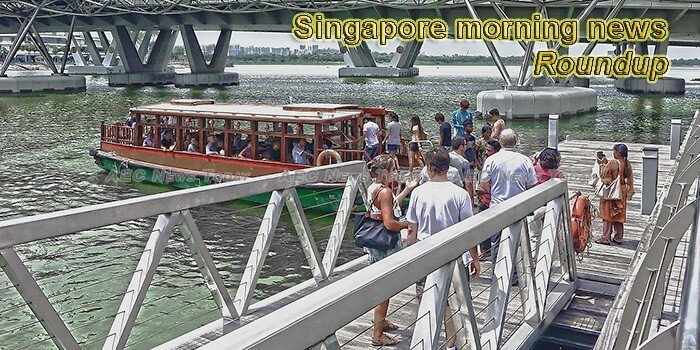 Singapore is a beautiful island city-state that has a lot of significance in the modern world. Ten game machines containing a total of 6,000 cartons of duty-unpaid cigarettes have been seized, the Immigration and Checkpoints Authority (ICA) said in a release on Wednesday (March 13). “We can confirm that Mobike has submitted a proposal to Singapore LTA [Land Transport Authority] for a managed and orderly withdrawal from the market,” said a spokesman for Mobike owner Meituan Dianping. A supercomputer from Singapore will soon jump almost 400 places to join the ranks of the world’s 20 most powerful machines. RHB Research says investors should stick with quality stocks on the Singapore market amid slowing economic growth and an uncertain external environment. Singapore’s growing elderly population means there will be more demand for support services for people at risk of age-related visual impairment, Finance Minister Heng Swee Keat said on Wednesday (March 13). Who says an online food delivery company can only deliver food? Streaming, as it is currently known in schools, may be on the way out but some parents still need to be persuaded that their children do not need to pick up every subject at the highest possible level. In India, something as simple as a WhatsApp message can be as deadly as a live bullet. A place known for its high standards of education, Singapore is now shifting to a more relaxed style at the primary and secondary levels, hoping to nurture people who can flexibly adapt themselves to a changing economy. Those planning a trip to Malaysia during the upcoming March school holidays should be prepared to face heavy traffic at the land checkpoints from Friday (March 15) to March 24. The Great Room’s co-working space in Singapore’s Centennial Tower doesn’t look like your average office. Singapore has been ranked the city with the highest quality of living in Asia, according to Mercer’s 21st annual Quality of Living survey. AWAK, a Singapore-based startup, has developed a new system that could revolutionise dialysis, and offer patients hope for a far greater quality of life. To encourage his brother to conserve water, 12-year-old Karthikeyan Sachin has a simple but effective plan – he will turn off the heater. American magazine The Atlantic just published a big feature about how Singapore’s quest to expand its landmass has lead to the decimation of mangrove forests in Cambodia. His iconic photos taken at last year’s historic Trump-Kim summit have been featured in top news publications around the world such as Time magazine, and even on a stamp by Singapore Post. SINGAPORE has come out tops as the country with the highest quality of living in Asia-Pacific, with the highest rank in personal safety. The High Court has struck out blogger Leong Sze Hian’s counterclaim against Prime Minister Lee Hsien Loong, due to Mr Leong’s failure to disclose a “reasonable cause of action” in his counterclaim. Businesses looking to digitalise their operations should ask why they are doing so before looking for funding options, Senior Minister of State for Trade and Industry Koh Poh Koon has said. Singapore has been clear and consistent that its position is that Malaysia has lost the right to review the price of water under the 1962 Water Agreement (62WA). In a move to better secure the landscape where China has been fast tracking its ventures at disputed territories, the United States will be sending two Littoral combat ships to Singapore sometime in 2019. PRIVATE-sector economists have lowered Singapore’s economic growth forecast for 2019 once again, easing slightly from an earlier prediction of 2.6 per cent in December. Apart from their own exchanges, more issuers would consider listing on the Singapore Exchange (SGX) in 2030 on the back of increasing focus on the Southeast Asian market, according to a new PwC report, Capital Markets in 2030. Amidst increasing tensions from recent international security issues in relation to China, US conservatives now aim to pass a law that restricts and monitors foreign student participation in “sensitive” university research projects. Malaysia has lost right to review water prices, MFA said. The Singapore Construction Mediation Centre (SCMC), which focuses in the construction industry to help firms avoid expensive and time-consuming court battles, has been launched on Tuesday (12 March) by the Singapore Contractors Association (SCAL).